Hunter Douglas products, the best America has to offer, are designed and custom-assembled in the United States. Our business is built on putting our customers first..
Seattle-Bellevue-Everett, WA (1888PressRelease) July 20, 2011 - Hunter Douglas, Inc., is the nation's leading manufacturer and marketer of custom window fashions. Available at Anchor Blinds in Seattle, WA. Hunter Douglas brand products are designed and custom-assembled in the United States* to assure that American consumers have the superb quality, outstanding service and enduring style they expect and deserve for their homes. * An exclusive Hunter Douglas network of fabrication companies with facilities around the country work in the communities they serve. They understand the local and regional needs and offer top-quality product and unparalleled support to their retail customer, including Anchor Blinds, a local store in Seattle, WA. "Our over 5,000 US employees are very proud to be providing our customers the finest quality and most innovative products available anywhere while supporting the local communities where they work and live," said Hunter Douglas President and CEO Marv Hopkins. Armi Avila-Lee, Design Consultant of Anchor Blinds, reflects that sentiment. "We're honored to offer Hunter Douglas products - the best our country has to offer - while providing our customers with the first-rate service, knowledge and experience for which we are known," Armi Avila-Lee said. "Our business is built on putting customers first and Hunter Douglas is the best way to do so in the window coverings arena." Underscoring the excellence of American design and craftsmanship, the exclusive Hunter Douglas Lifetime Guarantee instills added confidence and trust that all the company's products are of the highest quality and workmanship. A dedicated Colorado-based Customer Information Center with satellite customer service offices across the U.S. is in place to assist consumer and retail customers and help ensure their satisfaction. Hunter Douglas also exports its innovative window coverings from its U.S. manufacturing and fabrication operations to consumer markets in 38 countries on six continents, with demand rapidly growing and expanding. While demand for these products grows abroad, their effect on the American marketplace has been transformative. Over the past quarter century, Hunter Douglas has developed award-winning product innovations that have consistently delivered top performance and quality as well as on-trend style to American consumers, elevating the entire category in the process. These innovations include Duette® and Duette® Architella® honeycomb shades, Silhouette® Window Shadings, Vignette® Modern Roman Shades, Luminette® Privacy Sheers, Pirouette® Window Shadings and the new Design Studio™ Roman Shades. 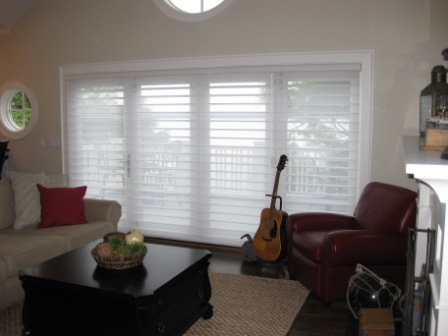 "Hunter Douglas products are not just beautiful and highly functional," continued Armi Avila-Lee. "They are designed to help provide consumers with solutions to important priorities such as energy savings and child safety at the window." "For example, Duette® Architella® honeycomb shades, with a unique, patented honeycomb-within-a-honeycomb design, provide superior energy efficiency, and are the first and only window shades without and add-on insulation systems that may qualify for the U.S. Federal Tax Credit on energy-efficient products through 2011. Vignette® Modern Roman Shades were the industry's first Roman shade with no exposed rear cords and were specifically designed to be that way." There's no question about it, Hunter Douglas' American design and craftsmanship is unrivaled here and internationally as well. For more information, please call Anchor Blinds, Seattle, WA at 206-407-3220 or visit their website at www.anchorblinds.com. *Some Hunter Douglas Contract products are assembled outside the United States.